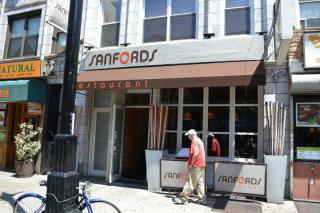 Sanford's Restaurant is located in Astoria,Queens and has been a landmark there for over 70 Years. It was opened in 1922 and was known to be a coffee shop that was open 24 hours a day and seven days a week. In 1975 it was bought out by a greek immigrant that continued with the idea of having coffee around the clock, but since his two sons took over they transformed it into a modern day diner. It now has very affordable wine and food that are delicious, and is still keeping up with the idea that it should be open all week.